Just after 11am on the 20th September 1942, the quiet Sunday stillness of the Emyvale countryside in north County Monaghan was shattered by the screaming roar of a Spitfire as it dived down, unmanned, from the clouds. Meanwhile, just over the border in Northern Ireland, its Royal Air Force pilot descended safely under his parachute while listening to the last fitful cries of his stricken warplane. Minutes later, it plunged into a field just over the southern side of the border in County Monaghan and exploded. It’s time in the war torn skies of Britain and Ireland was over but the epic story of the Monaghan Spitfire and the world it had fought in had just begun. 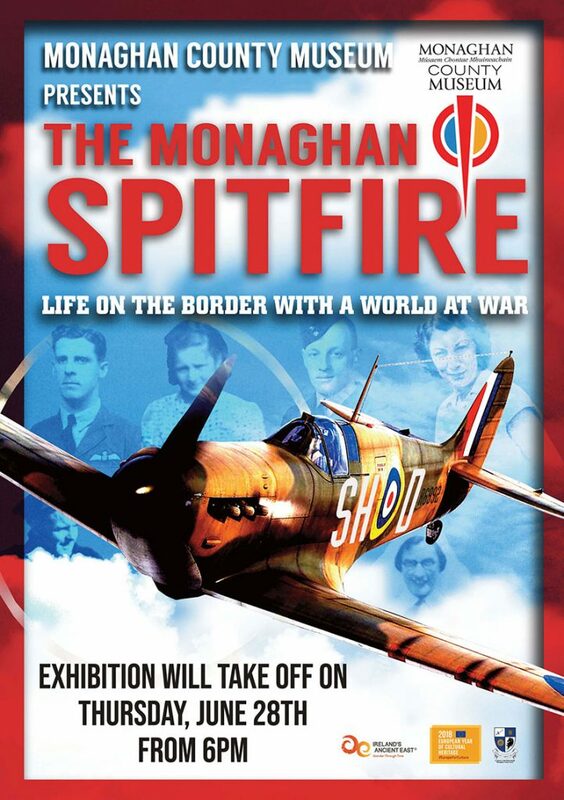 Monaghan County Museum presents their new explosive exhibition, The Monaghan Spitfire – Life on the Border with a World at War. This incendiary display, which has been developed in partnership with numerous organisations both north and south of the border including the Royal Air Force, Queen’s University Belfast and the Irish Air Corp explores the deadly experience of a county, which existed on the border between two worlds, one tearing itself apart and another, trying desperately to stay out of a global conflict which had almost engulfed it. Using never before seen artefacts and images as well as chilling firsthand accounts this enthralling exhibit will take the viewer on an exciting journey through life and death in Monaghan during the turbulent years of World War II, known in the Republic of Ireland as The Emergency. The Monaghan Spitfire crash site was excavated in 2017 by a cross border group including Monaghan County Museum, the RAF Benevolent Fund, Queens University and students from secondary schools, north and south. The stunning finds from the dig, chief among them the famous Merlin Rolls Royce engine of the Monaghan Spitfire will form the core of the exhibit. A fact which makes this excavation even more important is that the Monaghan Spitfire is the only one of its kind ever found in the Republic of Ireland that had been involved in the famous Battle of Britain. A number of objects will also be recreated such as a life size version of the 500kg German bomb, which was dropped on Monaghan in 1940. Thankfully no one was killed but the bombing created an enormous amount of damage in the area where it occurred. At almost seven feet high, the scale of this enormous explosive device, will provide visitors with a very real and immediate insight into the death and destruction, which was raining from the skies during this violent time. After the fall of the France in 1940, Nazi Germany turned its sights on Britain and the Monaghan Spitfire was involved in a number of the engagements during that desperate last stand known as The Battle of Britain. Had Germany been successful in invading Britain, it had developed a plan of invasion for Ireland, code named Operation Green. An original set of those German invasion plans will also feature in the display.